New bike sharing initiative in Bratislava started in September. Initially, 70 stations and 550 bicycles will be at the public's disposal. The promo pass is currently available for 1 EUR. 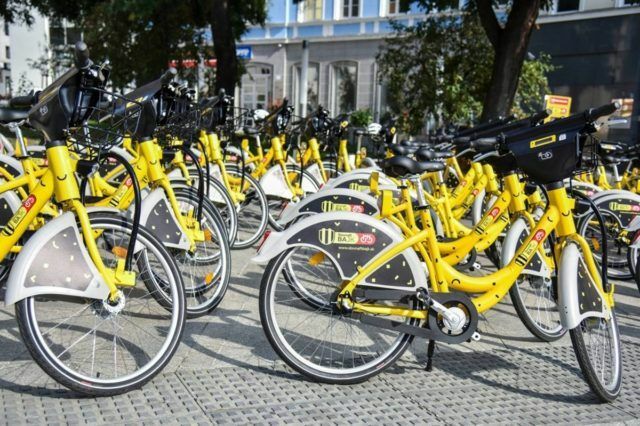 The system for renting bicycles, the so-called bike-sharing, is not a new idea but is an important and a popular solution that every Europe’s capital should offer. After sitting at a conference for the long hours, an explorative bike ride through the streets of Bratislava is a revitalizing and healthy choice! The city office together with the company Slovnaft prepared a bicycle system that will connect the capital’s boroughs of Ružinov, Staré Mesto, Nové Mesto, and Petržalka. At the end of the spring, White stands with yellow-black signs started appearing in Bratislava. The aim of the station placement was to integrate the automatic bicycle rental system into the public transport system, therefore priority was placed on stations close to public transport stops or close to existing cycle paths. The stations are located at a distance of approximately 300 to 500 meters. The Promo pass currently available is 1 Euro and will be available until the beginning of next year’s biking season. The pass covers an unlimited number of rides within 30 minutes and a credit of 1 Euro to cover longer rides. Rides over 30 minutes are subject to a fee of 12 cents for each 6-minute ride. Yellow bicycles started appearing on the streets of Bratislava at the beginning of September. At the moment 500 bicycles in Bratislava are ready to be rented at 70 stations over Bratislava. the number of stations should gradually increase to 90, and the number of bicycles to 750. If you want to rent a bicycle, you have to register at www.slovnaftbajk.sk via the registration form and pay online for the selected pass. You will receive an SMS message with the PIN code that you will enter into the keyboard on the selected bicycle. After the lock is unlocked, you can start your ride. In the pilot operation phase, registration is possible only via www.slovnaftbajk.sk. However, in the upcoming months, the Slovnaft BAjk mobile application will also be added to the system and users will be able to register and pay for the service at the smart stations we are currently preparing.